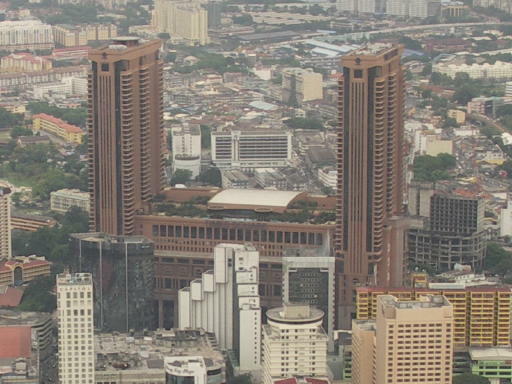 Kuala Lumpur = "Muddy Confluence"
When the Dayabumi Complex was completed in the early 1980s, it was the most expensive building ever constructed in the country. 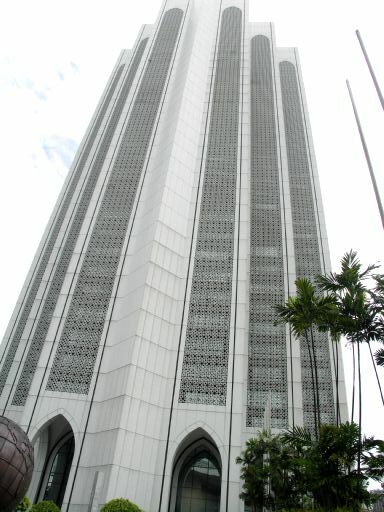 This 35-storey skyscraper was also the first building in Kuala Lumpur to use the unique blend of modern lines and Islamic motifs. 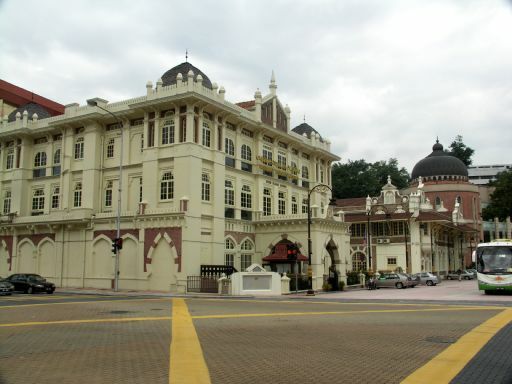 This architectural design allows the building to fit in well with the rest of the Moorish and Byzantine ambience around it, such as the Sultan Abdul Samad Building a little further down the road. Currently, there is a shopping arcade in the complex, which also houses offices and the General Post Office. 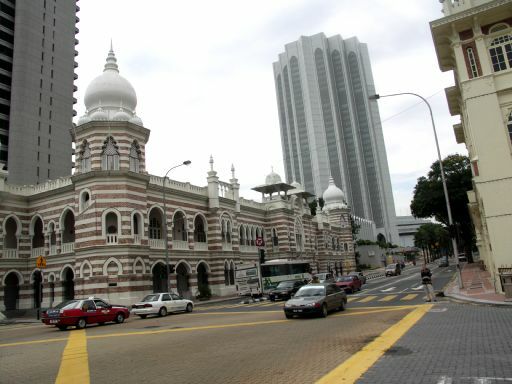 The Sultan Abdul Samad building, built in 1897, has been designed by British architect A.C Norman. The Moorish inspired design of the building is based the features of buildings in Islamic countries. It used to be the Colonial Secretariat offices, but now houses the Supreme and High Courts. 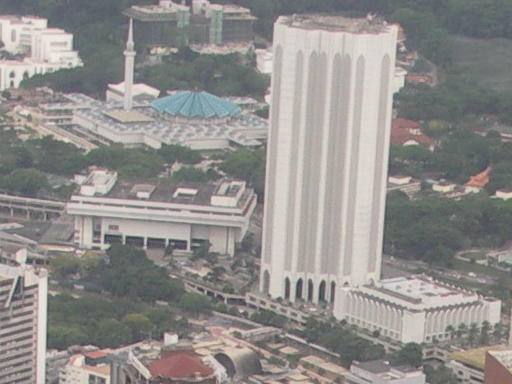 The centre of attraction is it's clock tower in the midle - KL's answer to London's 'Big Ben'. 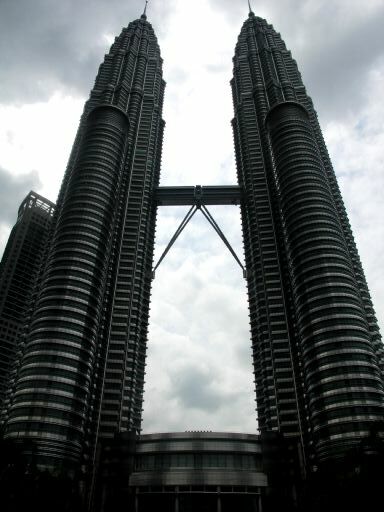 Kuala Lumpur’s story began in the 1820’s. 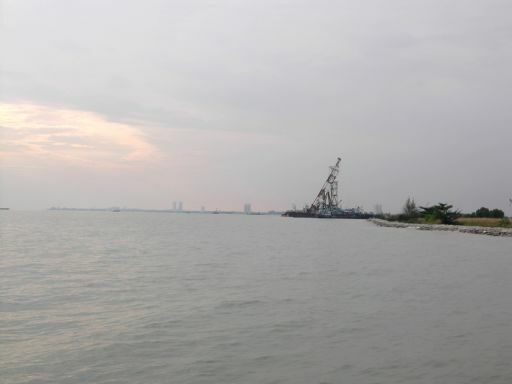 Malays, many from Sumatra had crossed the Straits of Melaka, hacked through thick virgin jungle and paddled up the Klang River to settle along its upper reaches. 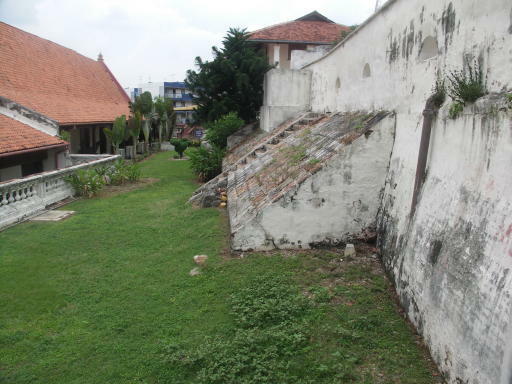 We hear of such early Malay settlements in areas such as Petaling about 17km from the city centre and a village called Kampung Haji Abdullah Hukum close to Jalan Bangsar about 9km from the city centre. These early settlers supplemented their meager earnings by planting paddy and panning for tin in streams nearby. Even such crude methods used in extracting the mineral, the positive reports of rich tin deposits in the area raised quite a bit of interest. Raja Abdullah, the Malay Chief governing almost the entire Klang Valley, was especially interested in making profits from tin. In 1857 he made a shrewd decision to send a party of 87 Chinese miners upriver from Klang to mine for tin in the upper valley. 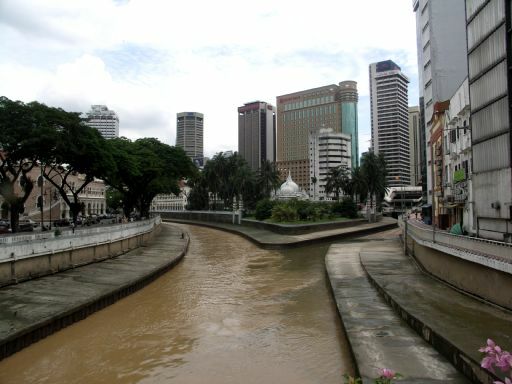 It took travellers 3 days of river traversing during the rainy season to get to Kuala Lumpur and if attempted during the dry season, the journey took 10 to 15 days. 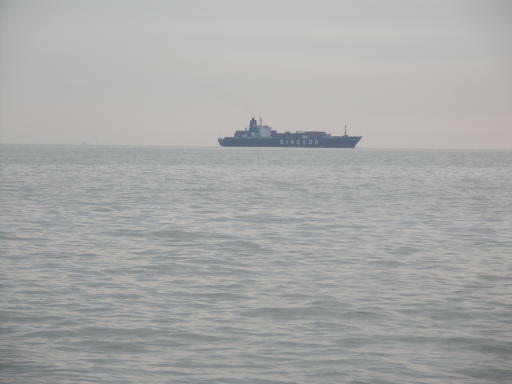 A hard journey with many occasions of dragging boats over sandbanks or shallow waters, with wild, ferocious animals lurking at every corner and having to cope with bouts of malaria and other tropical diseases. 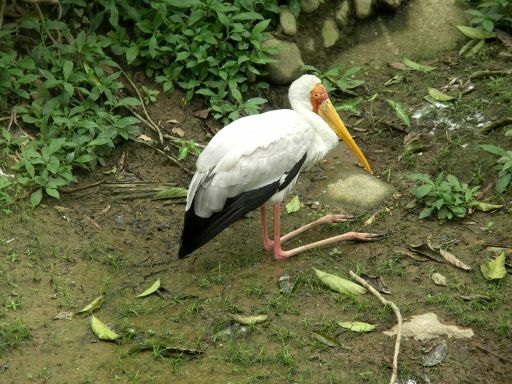 Miners and labourers arriving at the confluence of Klang River and Gombak River disembarked on the sandbank, where they continued on foot through vague jungle paths heading to the mines. 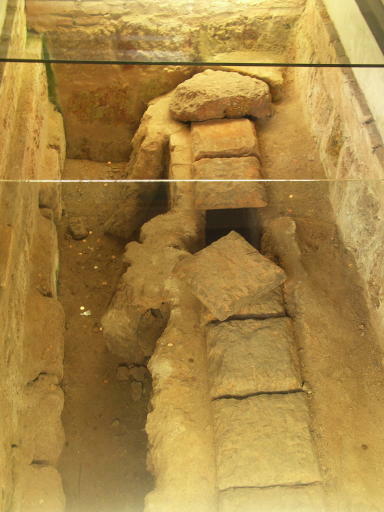 The early mines were located to the east of the confluence, at a place called Ampang. So began the arduous task of prospecting. 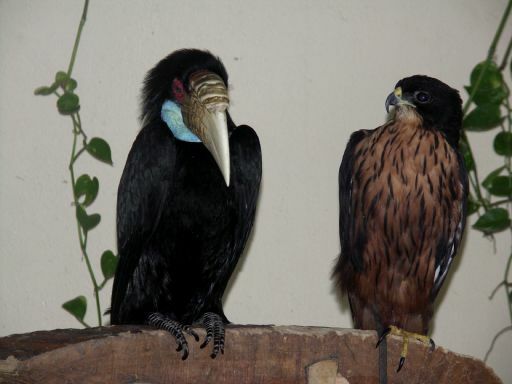 Being rather superstitious people, the Chinese prospectors engaged the help of a local magician or ‘pawang’ as known in Malay, who purportedly had favourable connections with the spirits of the jungle. 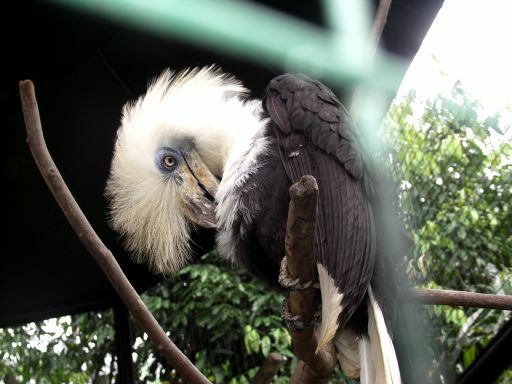 Armed with some knowledge of the area’s geology supplemented with incantations, the ‘pawang’ was hired to locate areas for mining. If tin was found, a fee was further negotiated with the pawang for his consultation on how to appease the local spirits to ensure that their progress in the area was not jinxed. The miners began work on the selected area by damming the streams, rivers and bogs so that they could excavate the water logged area. 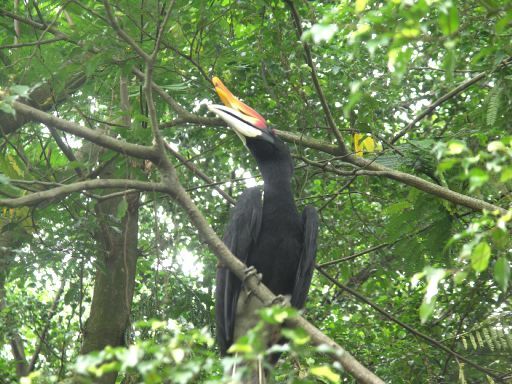 Hence the area was aptly named Ampang - meaning Dam. 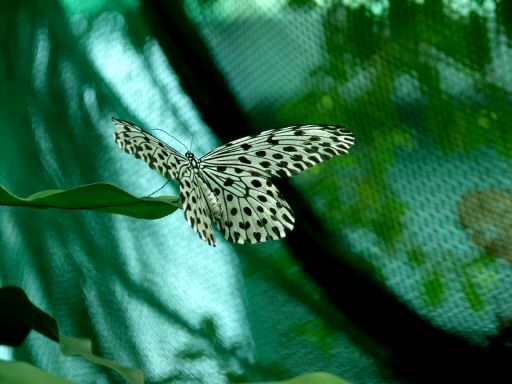 However, the clearing of jungle in the area exacerbated the harsh conditions, which the immigrants already had to endure in this untamed, foreign land. 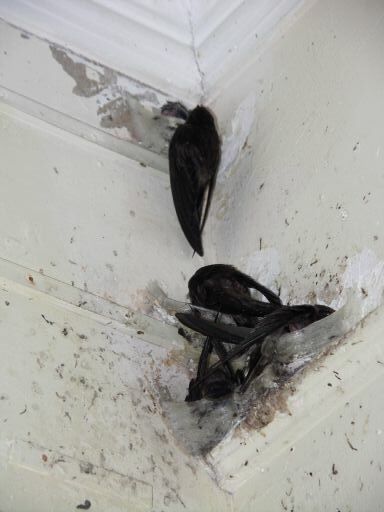 Mosquitoes began to breed in large numbers, bringing with them, a spread of malaria. Within a year, only 18 of the 87 miners survived. But yet upon hearing of the riches to be found here, more immigrants were sent to replace the fallen and soon a bustling trade bloomed. The Klang-Gombak junction, close to where Masjid Jamek is now situated, was the point for loading tin ingots and unloading food supplies, weapons, shovels, pans, and more immigrants to man the mines. Boats meandered up and down the river and Raja Abdullah prospered beyond his imagination from these mines. Persuaded by a local Malay chief in the Ampang area, two pioneer Chinese traders of Hakka descent, set up their sundry shop at the confluence. Some believe these 2 traders as founders of KL where others lean towards Raja Abdullah. 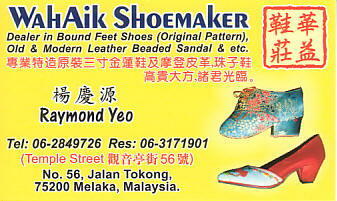 Their shop was strategically located on the right hand side of the Klang River facing upstream. They did brisk business selling all sorts of provision to new labourers and miners disembarking at the jetty. 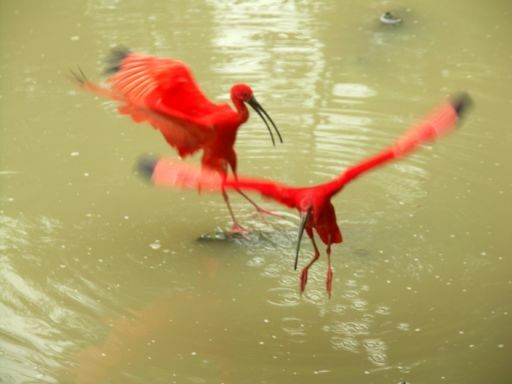 These two Chinese traders later became powerful members of the Chinese Secret Society in KL. 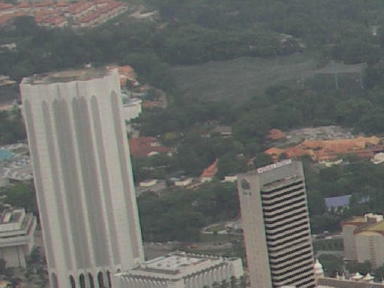 It is not clear how the name Kuala Lumpur came about. Many theories were formed to satisfy this. 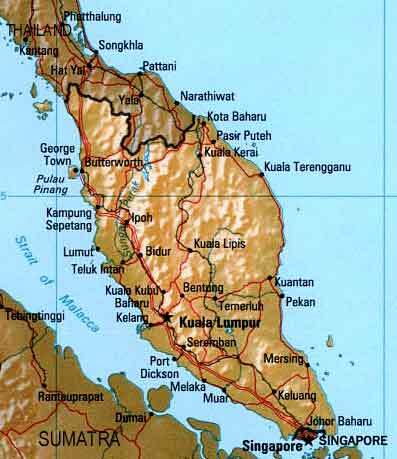 ‘Kuala’ means estuary or junction and in Malay usage, the name of the river or tributary that ends at this point should follow. Which means that this place should have been named Kuala Gombak but it wasn’t. 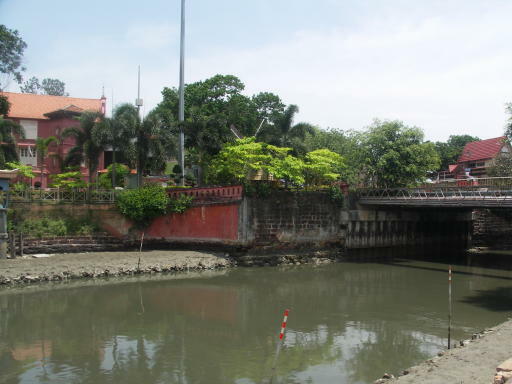 ‘Lumpur’ which means ‘mud’ could be used to attribute the condition of the river. 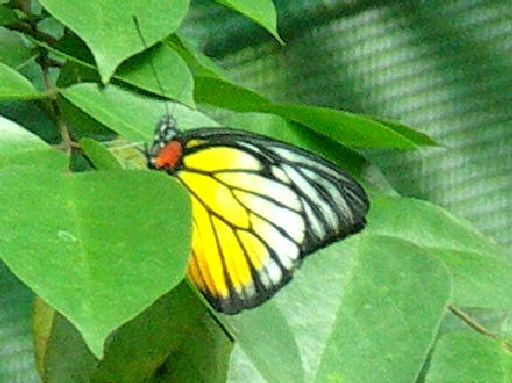 Another theory was that there used to be a tributary called Sungei Lumpur, which joined with the Gombak River just before the confluence. 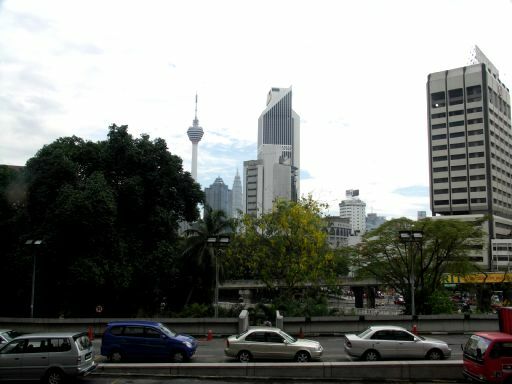 With all the theories, one thing was certain, Kuala Lumpur began as a trading post at this river junction, which gave it its name that has remained to this day. The significance of these waterways, the lifelines of a land can never be disregarded. However, by nature of development, rivers that had once been the epicentre of a growing township are now reduced to mere aesthetic swatches in this canvas of modernity. One man instrumental in the rise of Kuala Lumpur was Yap Ah Loy. This young man left his village in Kwangtung, in the Southern province of China to seek fame and fortune in far-off shores, apparently lured by a recruiting agent with tales of wealth to be made in Malaya. He signed up, arrived in Malaya in 1854 at the age of 17 and worked as an immigrant labourer, later a cook and then a pig dealer before finding a position in a Chinese secret society.Powered by sheer tenacity, bravery and a fine demonstration of leadership quality especially during the Selangor Civil War, Yap Ah Loy found himself a group of loyal fellowmen who were prepared to fight under his commands. He ploughed his way to the position of first assistant to the Kapitan China within a short period of time. In 1868 Yap Ah Loy succeeded his predecessor to become the third Kapitan China of Kuala Lumpur. 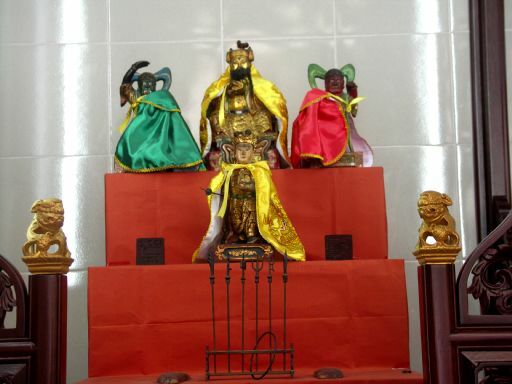 In those days, Chinese immigrants embarking on a new life far from home were initiated into secret societies where he was sworn to serve and obey rules of the society in return for mutual help such as decent burial rites, passage home to China etc. These hapless men found solace in their ‘extended families’. Most would turn to and are readily accepted by their own dialect groups who in turn formed their own secret societies. 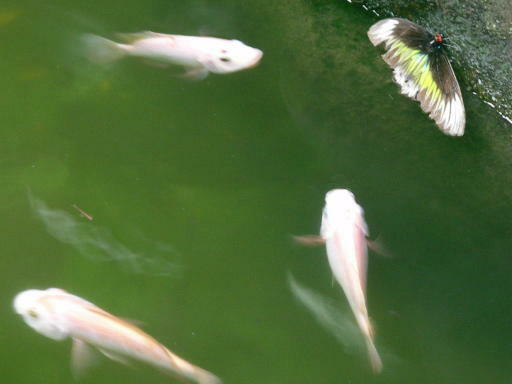 Once again assuming communication difficulties, as there are numerous dialect groups in China, it makes sense to associate with groups of people who one can communicate with. 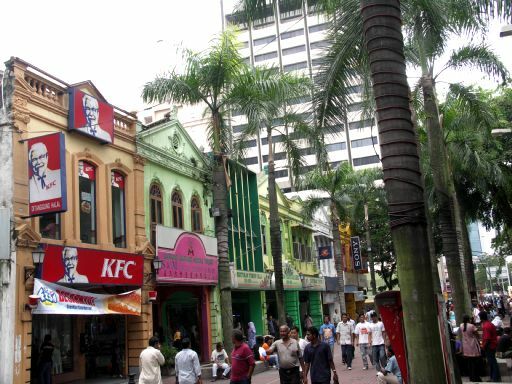 Although KL was then already teeming with overzealous Chinese immigrants, there were also the local Malays who traded with the Chinese but lived away from the them. Malays being Muslims, view eating pork as offensive and the Chinese had a fondness of rearing pigs within their living quarters. 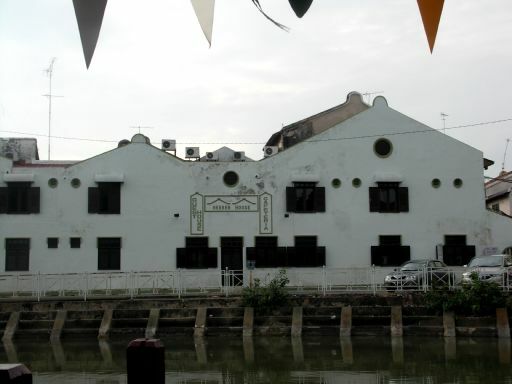 A short distance away from the chinese quarters, the Malay quarter rested on stilts along the east side of Klang River which was later named Java Street, where goods were delivered and passengers alighted enroute to mines in Ampang, Batu and Pudoh. The main roads leading to these areas today preserve the old trodden tracks used by hundreds of mining coolies over 140years ago. 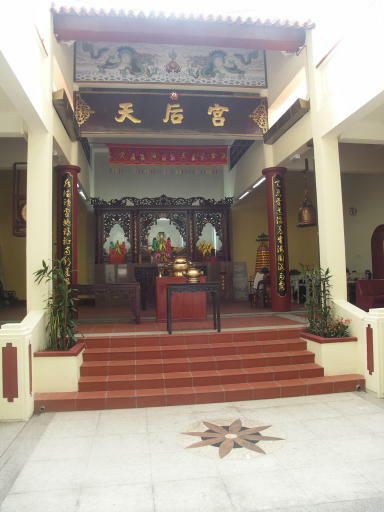 It was the Malays, who conferred the title Kapitan China on the headman of the Chinese community. 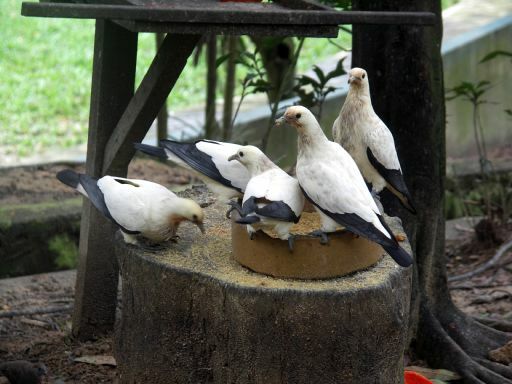 The state’s Malay Rulers, who presumably faced communication difficulties with these newcomers, preferred to deal exclusively with one man and that would naturally be the headman hence the Kapitan, ie more often than not, the head of the most powerful secret society. Although, the Chinese were influential in the development of Kuala Lumpur, the Malays were the backbone of the society and maintained their position as traders and farmers growing garden produce and paddy for the community. Frank Swettenham, was transferred from Singapore in 1881 for the post of second Resident of KL. A Resident was a British Official appointed on behalf of the Queen of England to advise the Malay Sultan or the ruler of the State on all official matters except on religious grounds. Swettenham was no stranger to Kuala Lumpur. However things were beginning to change. In 1879 along with the second rise in world tin prices, an influx of Chinese miners brought in to open more mines contributed to an increase in population. Within a year the Chinese community had ballooned to 4000 people. The town was not equipped for such an increase and the town's structure began to disintegrate. Filth, disease and the stench were only the start of the problem. Fire would break out periodically and with inadequate fire fighting equipment except for a mandatory instruction from the Kapitan to ready a bucket of water in every household, little could be done to contain the fire. 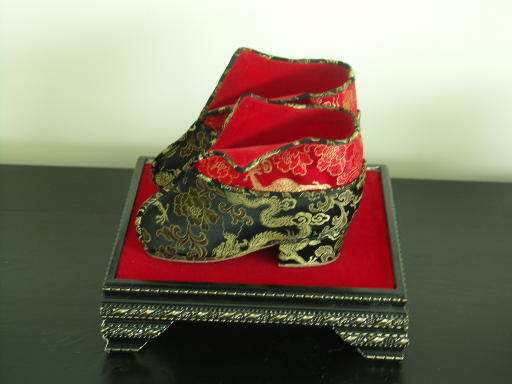 On 4th January 1881, an overturned oil lamp in an opium den spread quickly and in no time had engulfed the town. The settlement of about 500 houses was rebuilt with bricks and tiles instead of timber ply, mud walls and palm thatch roof with the cost of rebuilding borne by Yap Ah Loy. 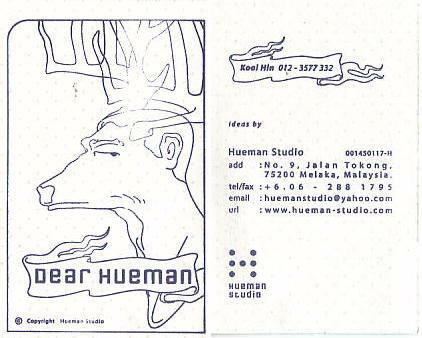 This may have been the beginning of town planning in Kuala Lumpur. 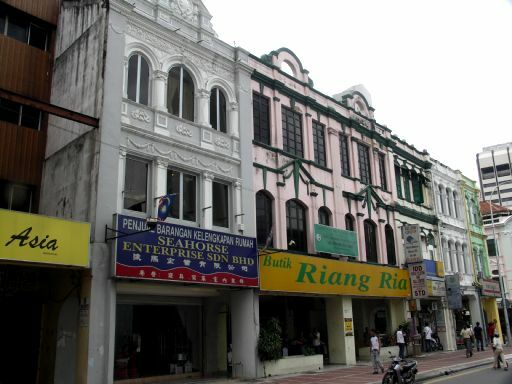 The High Street, now called Jalan Tun HS Lee showcases early 1880’s shophouses. 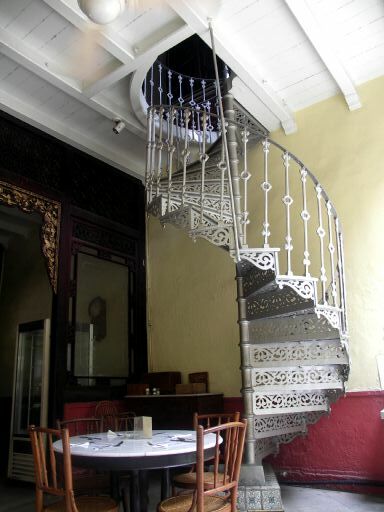 Shophouses were designed for the practical lifestyle where occupants lived upstairs and worked downstairs. 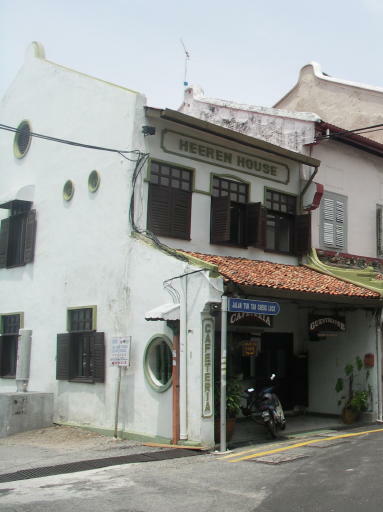 The typical shophouse had a short frontage but with a depth of two to three times its width. 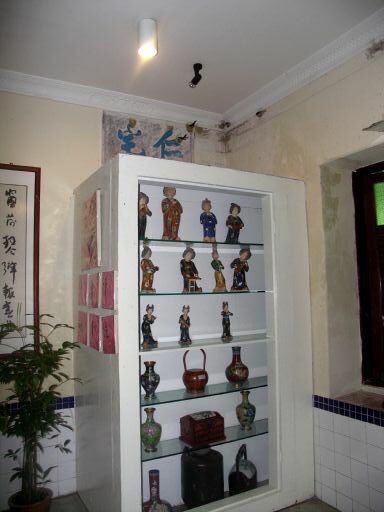 The owner was required to set his building back in order to accommodate, what we call 'the five-foot walkway'. This covered walkway or veranda was used as shelter for pedestrians from rain and shine but during the early stages were more often than not occupied by cows , goats and gunnysacks full of produce were often found blocking most of the walkway, spilling over onto the pavement from the shopkeeper’s store. As always practicality overrides all for ingenious utilisation of space - take a look at the upper floor. The lost of space from having to include a five-foot walkway on street level and also central air well, is fully compensated by extending the upper floors over and covering the walkway. The upper storeys had shuttered windows to allow lots of circulation and to reduce added weight to be supported over the walkway. At the back of the shophouse, the shopowner was to leave space for a lane, which was required by town planners that was wide enough for bullock carts to move through to collect sewage and for the fire brigade if needed. Shophouses on the High Street, numbering 34 through to 40 are about 2feet lower than other adjacent ones and are purportedly the original 1880’s buildings although the original roof have now been replaced with corrugated iron or tiled roofs. The street level was raised over the years due to frequent repaving of roads. The lower the walkway, the older the shophouses. Sadly, many of the old shophouses are being demolished or refurbished…a process aided by the lifting of the Rent Control Act in January 2000 where owners of pre-war buildings are now allowed to raise the rent of their premises to the market value thus indirectly or directly turning out tenants who have lived and traded there for generations. 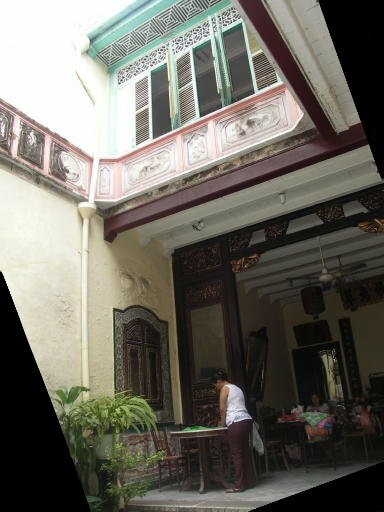 Before this Act of 1966 was repealed, the average rental was RM200 per month - ridiculously low for our day but effective in a way, to deter many from refurbishing the shophouses or opting for new tenants. 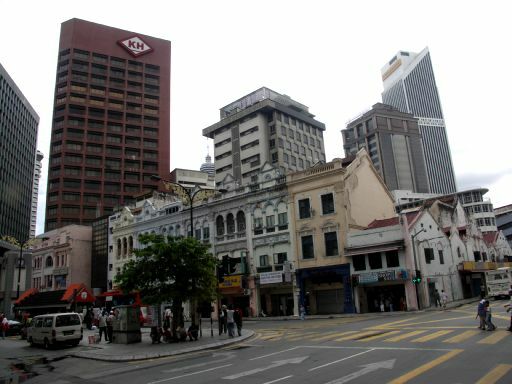 According to statistics available, the total of pre-war buildings in KL is only 2,500. And even so, the numbers are falling fast. Now, with this form of passive conservation efforts having been abandoned, there is no telling what plans will be in store for the historical monuments….let’s hope that we don’t lose our identity in our strive towards modernism. 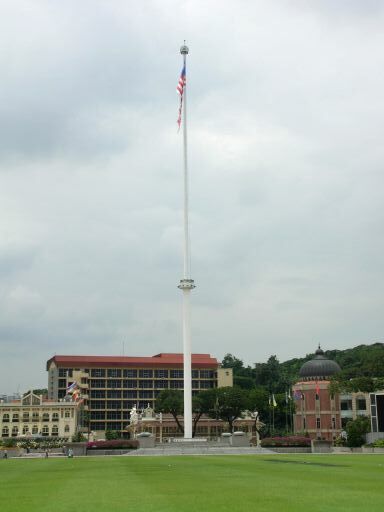 The original town was centred on the market square area, a convenient location for traders - you can see just ahead, the confluence of the Klang and Gombak Rivers. This was where the boats docked. 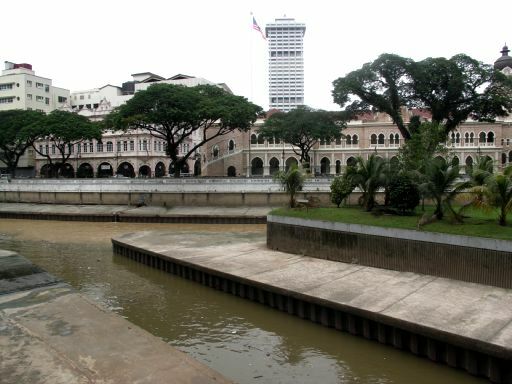 That would be a little triangular patch of grass at the corner of the Jamek Mosque on the opposite riverbank. 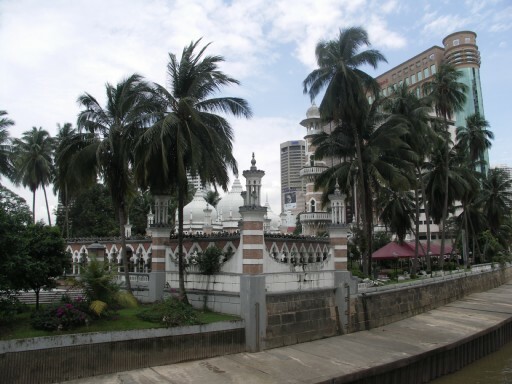 The Jamek Mosque was built by the British in 1909 and was the town’s national mosque until the new national mosque was built in 1965. The architecture of this mosque is very much Moorish (of Islamic-Indian influence) which, in fact was a favourite with the Colonial architects. 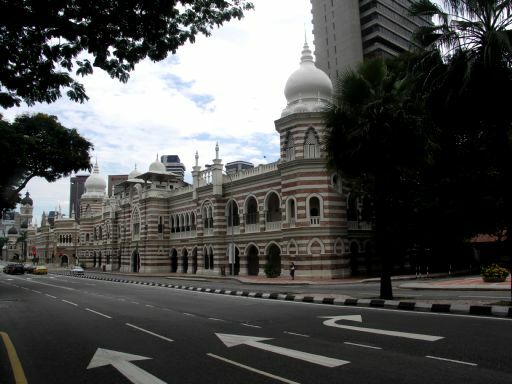 Many of the British officials were transferred from India and believed that their designs would blend in with the Islamic faith of the Malay Sultans. 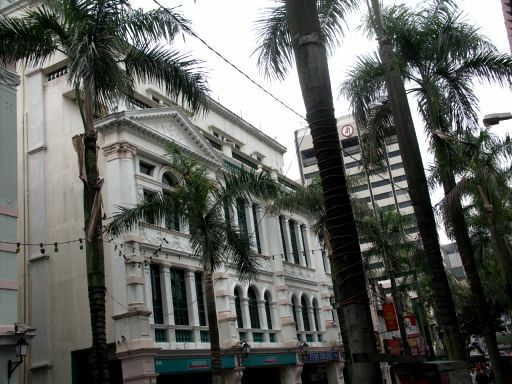 After the great fire of 1881, Yap Ah Loy rebuilt his mansion just where the Hong Kong and Shanghai Bank is and from here governed over his community. 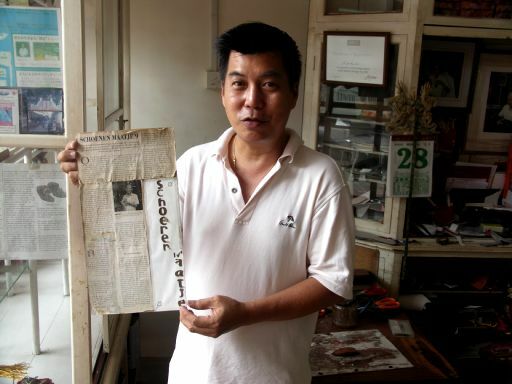 Yap Ah Loy belonged to the Hai San secret society, whose members were mostly of Hakka dialect as he was. A small man with a fiery temper and a reputation to match, Yap Ah Loy built his empire on the many tin mines in Kuala Lumpur. 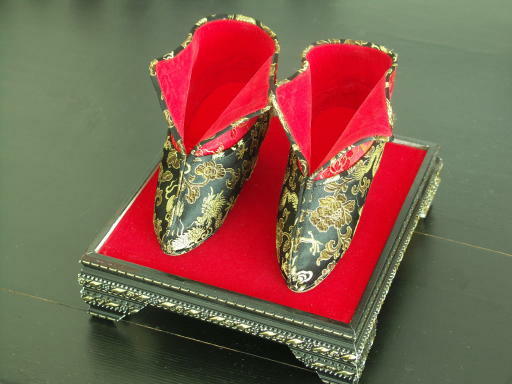 With such autonomous rule over the Chinese community in Kuala Lumpur, he was vested with the power to control the gambling and opium dens and brothels. 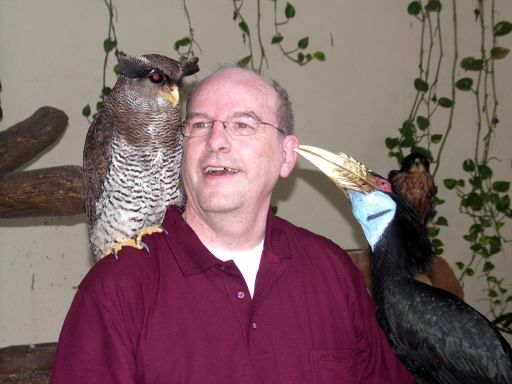 Also as self-appointed governor of the town, he levied taxes on the community. Its been said that during the more peaceful years under Yap Ah Loy’s watchful eye and a full police force of only six - law and order was maintained. Robbery was virtually eliminated. If a Chinese was found robbing, as first offence the incriminated was dragged through the main street with the stolen loot tied to his back. 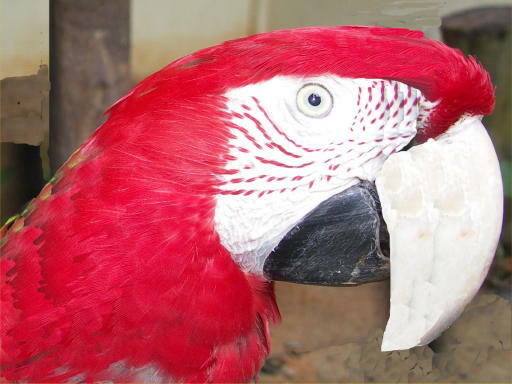 The second offence would result in the slicing of an ear and the third offence, which of course only a kleptomaniac would attempt, resulted in execution. However, law and order was also played to his fancy. During the Selangor Civil War, he had word out to the community that anyone who would bring him the heads of his enemies, he would be rewarded handsomely in silver dollars. Yap Ah Loy, wasn’t about to lose his turf to other secret societies who were eagerly vying for his most lucrative position. Not being able to communicate with the Chinese, the British naïvely accepted Kapitan Yap as their trusted informant. 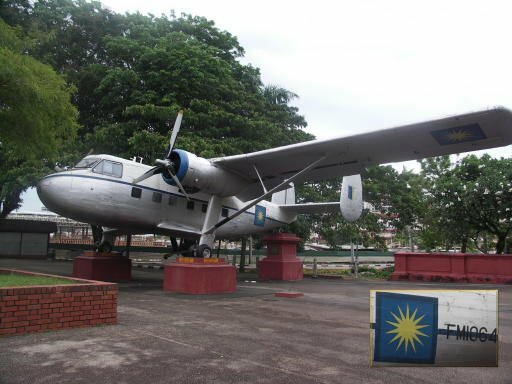 They relied on the Kapitan for any news of secret society activities in KL and upon receiving news of such, they would despatch troops to control the situation. Obviously, Kapitan Yap used this opportunity to keep his enemies at bay. He played his game only too well. Yap Ah Loy was the headman to the most prominent secret society in the state, and what better way to handle competition by playing the victim in times when there was a greater protector. In the Market Square, Kapitan Yap’s business was thriving. Weary workers thronged the market all day and all nightlong in hope of making it rich at the gambling tables. Or to sooth their pain, they chased their worries away with opium and their loneliness in brothels. He owned all such outlets in the area. 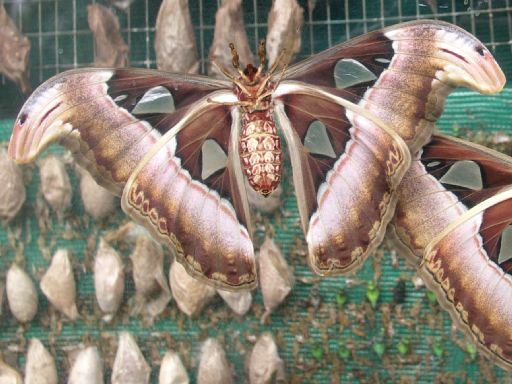 An American naturalist named Hornaday visited the market in 1878. He was pleasantly surprised when he ambled into one of the Chinese provision shop and found Champagne for sale at 60 cents a quart and India pale ale at 15cents per pint. He was only too pleased at being able to get his hands on such cheap good alcohol in a frontier town as it was then. Not everyone liked the market. Swettenham loathed the conditions at the Market Square and was determined to rid the place of the ramshackle sheds. They came to a compromise where Yap Ah Loy agreed to demolish his atap sheds and to replaced them with bricks and a galvanised iron roof. 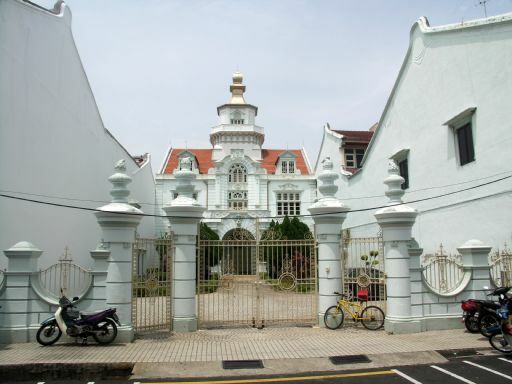 Swettenham in turn, granted him the title of the land for life which upon Yap Ah Loy’s death in 1885 at the age of 48, was returned to the government as stipulated in the agreement. 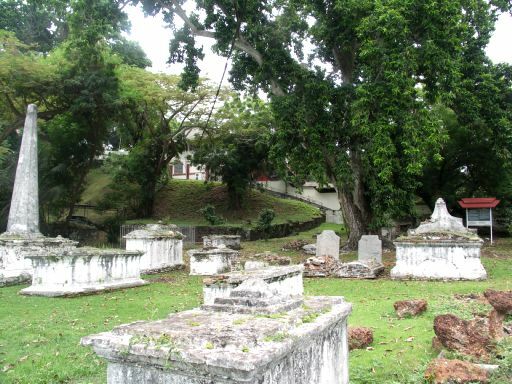 Swettenham took this opportunity to relocate the market to a site close to the current Central Market and had the old market dismantled to make way for a square. At the old Market Square, a clock tower was placed here in 1937 to commemorate the coronation of King George IV, Queen Elizabeth’s father. Of Art Deco influence, it is decorated with abstract geometrical designs, typical art deco of which was immensely popular in the 30’s. 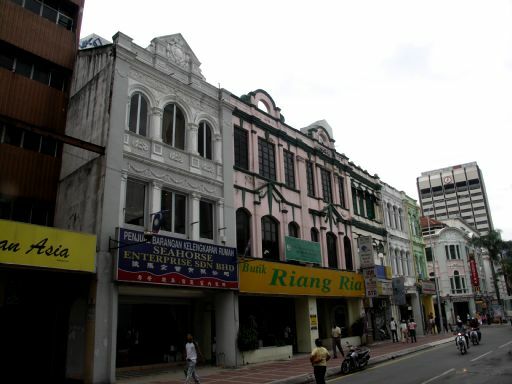 Another type of architectural design is found in a row 3 storey shophouses fronting a part of the square. The Government architect, AB Hubback, in 1907 introduced neo-classical design to his buildings, demonstrated in its decorative plaster garlands, balustrades and gables on the roof. 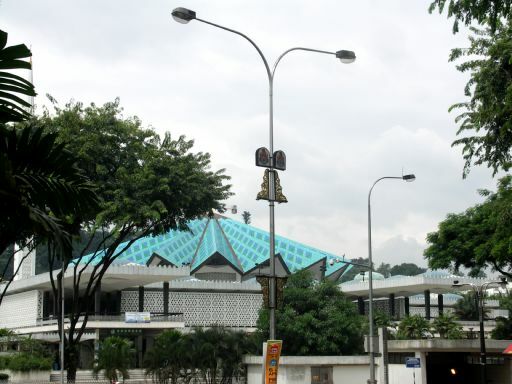 Incidentally, Hubback was also involved in the design of the Jamek Mosque. Take a look at the delicate Dutch gables at the top - although the block is designed as a whole, each shophouse façade has its own look. 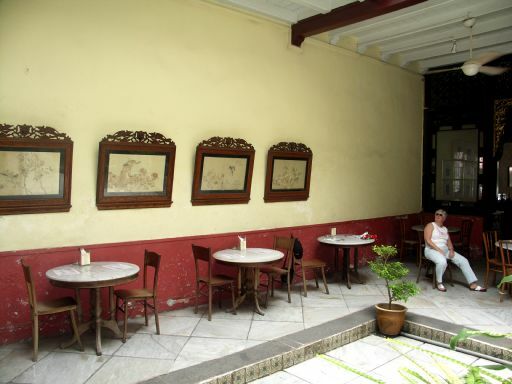 During the younger days, the restaurant was a favourite with planters then and was known as The Vatican. 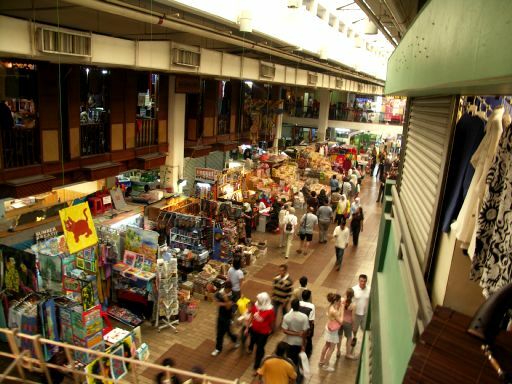 Central Market was built in 1936 when the site chosen by Swettenham 40years prior was opted for the new and current location. I remember the days when one could hardly see the frontage of the market. The endless sea of stalls spilling out of the building into the square with each stall’s large umbrellas overlapping the next stall’s, creating a well-covered walkway through the labyrinth of alleyways only experienced local shoppers can find their way through. Central Market was then like all wet markets….which if you have the time you may experience one at Chinatown itself. It was dirty, wet, and soggy especially after rains. 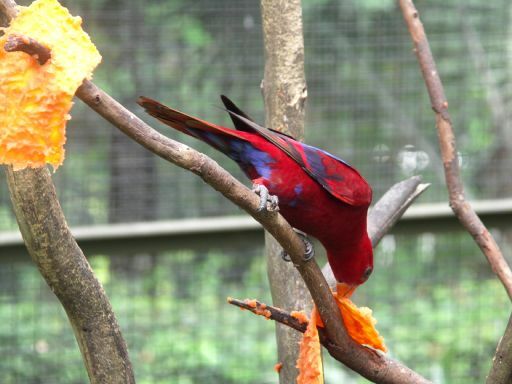 There were all sorts of lively going ons, vibrant colours, noises, voices, languages, smells, fragrants..it was, well, where one could get almost any produce desired. It was the town’s largest wholesale and retail market. 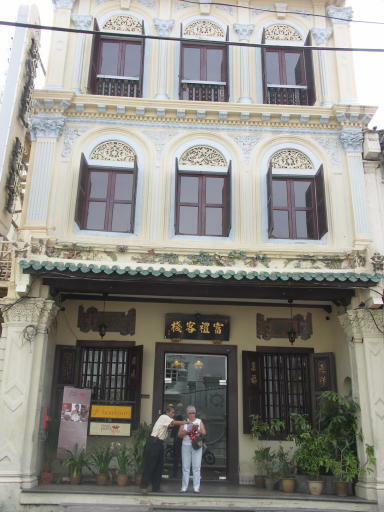 The shophouses flanking the market were mainly provision shops selling a variety of dried, preserved and vinaigrette stuff such as century eggs, Chinese sausages, sharks fins, sea cucumber, abalone, large ceramic pots containing preserved, salted vegetables stacked neatly in a corner. Sadly even these shops that have been in families for generations are no more…only to be replaced by trendy franchise outlets. 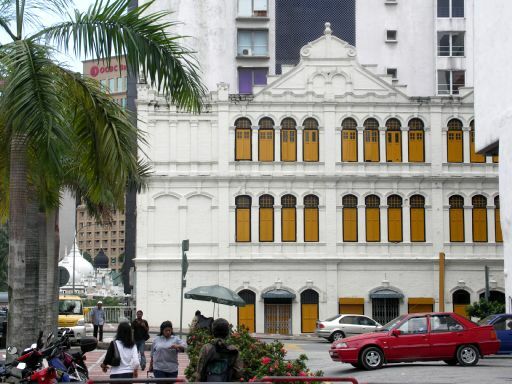 For years, the Art Deco building of Central Market was , the largest single room in KL. The windows and skylight are made of “Calorex” glass, which admits 60% of the sunlight but transmits only 20% of the heat . 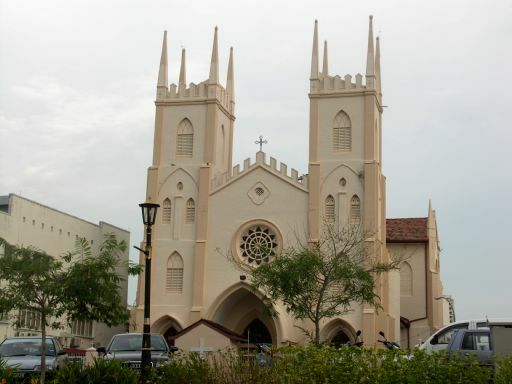 It won a coveted award, the Best Decorated Building Award in 1953. 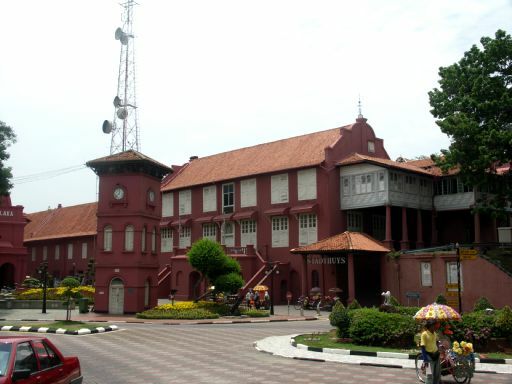 During the 1980’s economic boom, there were plans to demolish the building and its surrounding shophouses. Much publicity and public participation saved the buildings from the demolition team and has now been restored as a central market once again…its resurrection?…. 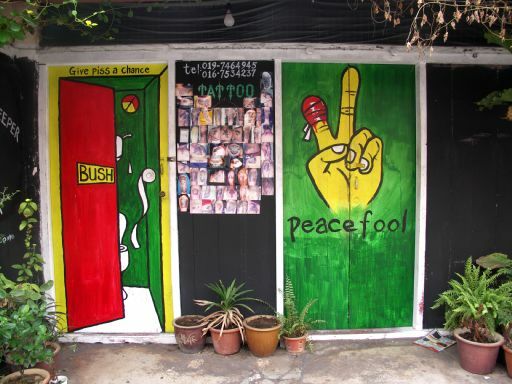 a cultural centre. 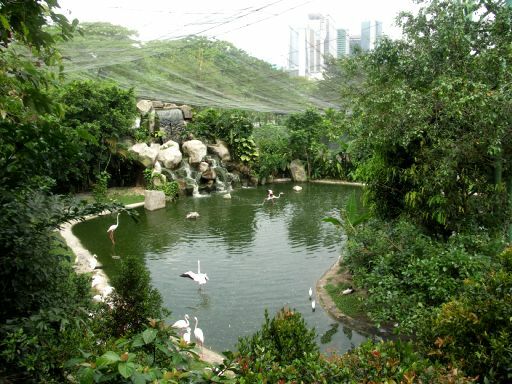 Located in the serene and scenic Lake Garden, the KL Bird Park is the largest " walk-in Free Flight Aviary " in the world, houses more than 3,000 birds and approximately 200 species from all over the world. 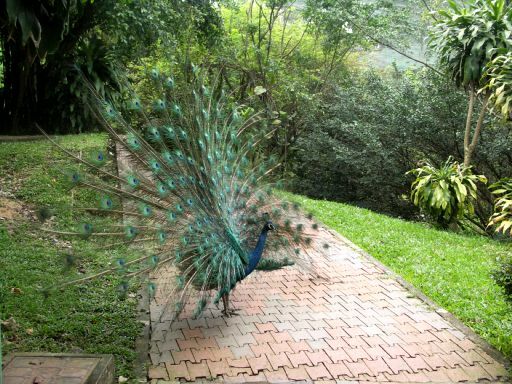 Sprawling approximately 20.9 acres of verdant valley terrain, birds and nature lovers can have a field day watching colorful sights and melodic sound of birds perching and winging about freely while enjoying the natural and beautifully landscaped surroundings. The site seems illfatedly hosted first by now defunct Planet.time.net then by Tripod.com and in both cases got hardly downloadable. Parameswara was a fourteenth-century Palembang (Sumatra) prince, fleeing from a Javanese enemy and trying to settle down with his followers. 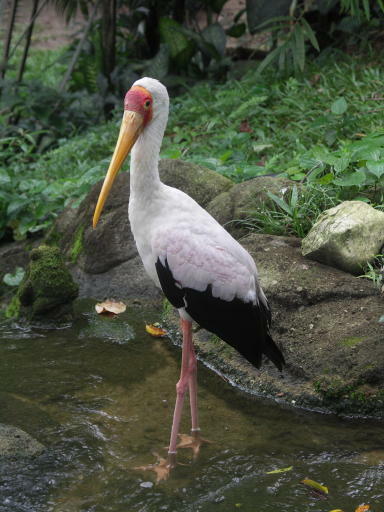 During a hunt near the mouth of the river Bertam, he saw a white mouse-deer or pelanduk kick one of his hunting dogs. 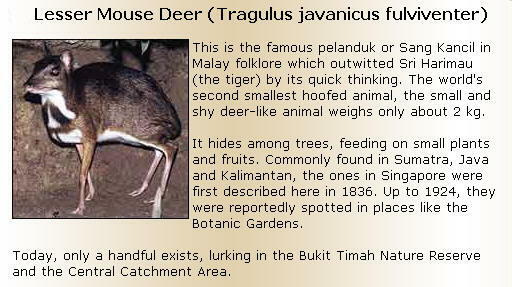 He was so impressed by the mouse-deer's brave gesture that he decided to build a city on the spot and he used the name of the Melaka-tree under which he was resting to name the city. 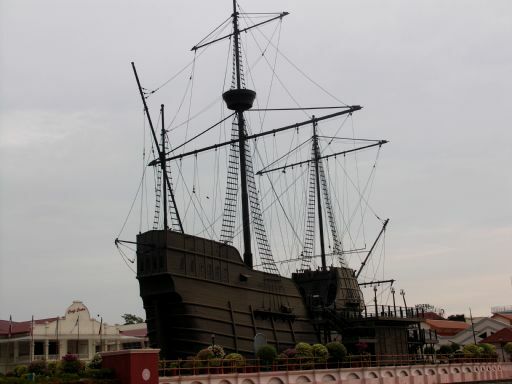 Midway along the straits that linked China to India and the Near East, Melaka was perfectly positioned as a centre for maritime trade. The city grew rapidly, and within fifty years it had become a wealthy and powerful hub of international commerce, with a population of over 50,000. 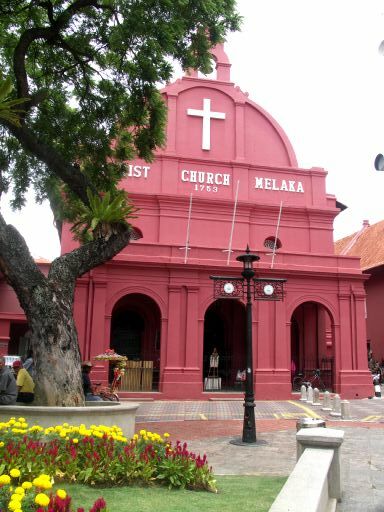 When Europe began to extend its power into the East, Melaka was one of the very first cities to attract its covetous eye. The Portuguese under the command of Alfonso de Albuquerque arrived first, taking the city after a sustained bombardment in 1511. 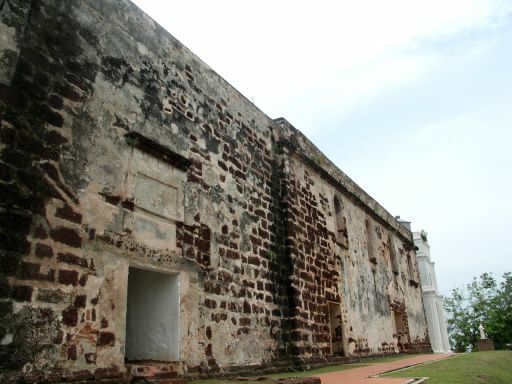 The Portuguese constructed the massive fortification of A Famosa or Porta De Santiago (right), but only a small portion survives today. 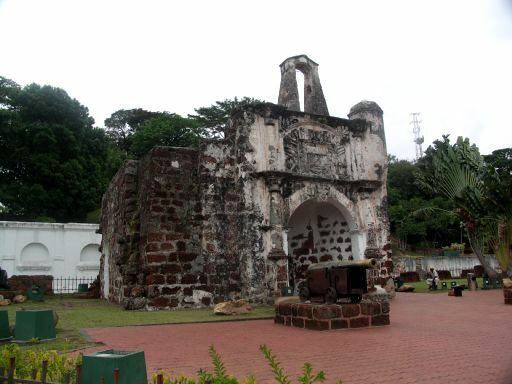 The Portuguese controled the city until 1641, when the Dutch after an eight-month siege and a fierce battle in 1641, captured Melaka. 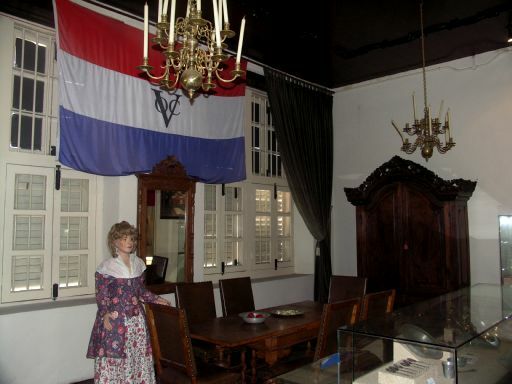 The Dutch rebuilt the city and occupied it largely as a military base, using its strategic location to control the Straits of Malacca. 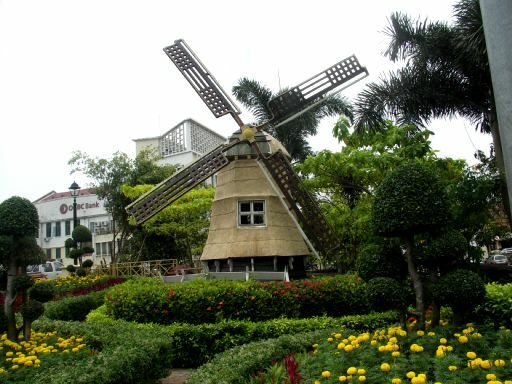 In 1795, when the Netherlands was captured by French Revolutionary armies, Melaka was handed over to the British by the Dutch to avoid its capture by the French. 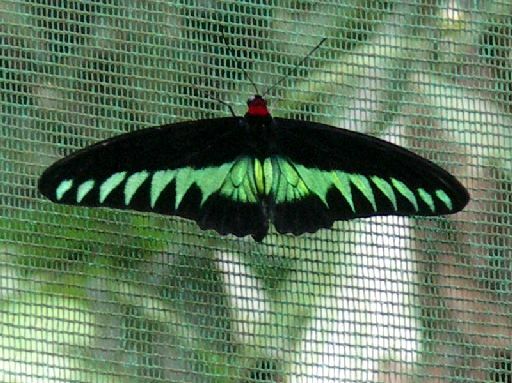 Although the British returned the city to the Dutch in 1808, it was soon given back to the British once again in a trade for Bencoleen in Sumatra. From 1826, the English East India Company in Calcutta ruled the city until 1867, when the Straits Settlements ( Melaka, Penang and Singapore ) became a British Crown colony. The British continued their control until the Second World War and the Japanese occupation from 1942 to 1945. Following the defeat of the Japanese, the British resumed their control until 31st. August 1957, the proclamation of Malaysia's independence. 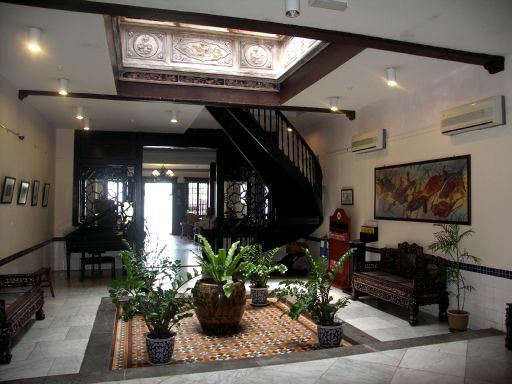 We stayed in the lovely "Hotel Puri", a carefully restored Peranakan house, which once belonged to the decendants of an eminent philanthropist and rubber plantation owner, Tan Kim Seng. 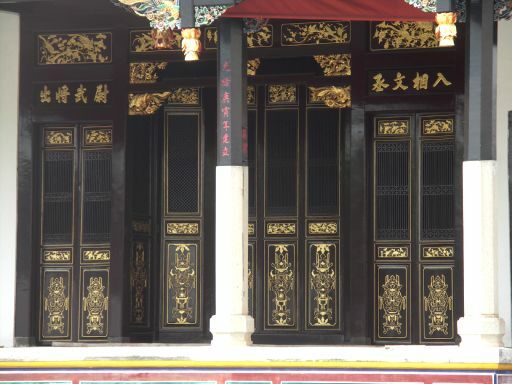 Extending 100 metres long, its distinct characteristics are its beautiful and intricately decorated facade and the impressive length of the house. 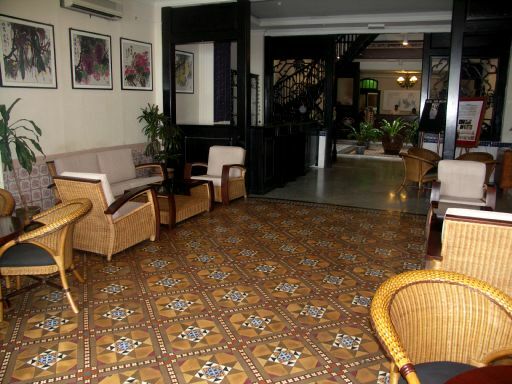 Retaining its old charm, Hotel Puri Melaka provides modern amenities to its hotel guests. We felt realy sorry to stay only one night there. 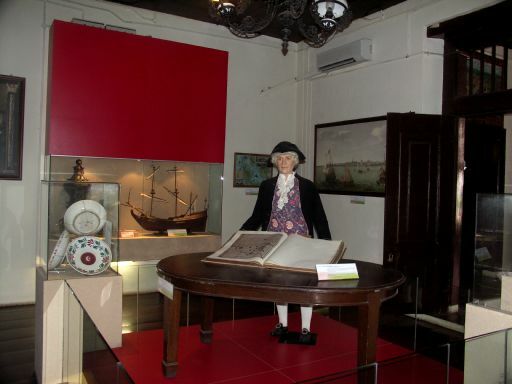 We met the Singaporean owner and his wife, and learned that they are also the founder of the Zheng He museum in Melaka, very worthwhile to visit. Hotel Puri is in the "Heerenstraat"
and in there the "Jonkers Reataurant"
There are many houses used as "Ancestral home"
We bought a series of blockprints from Hueman, a local artist with a very refreshing modern outlook on life. 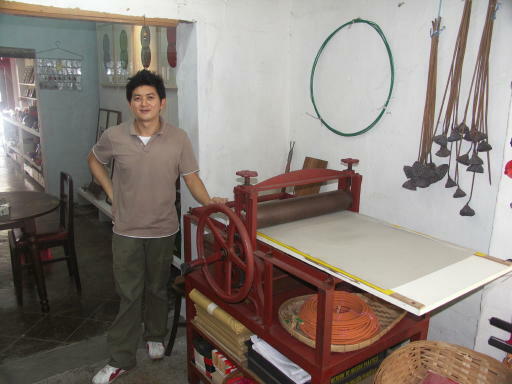 He built his own block-printing-press from a latex-press he obtained. The series we bougth was very reasonable priced just over one hundred ringit per piece. It is not a limited series, as he explained, because that would bring the price beyond the scope of most of his custyomers. The series is about the five elements, wood, water, earth, fire and iron, using appropriate colors, the chinese character and symbols designed by himself. 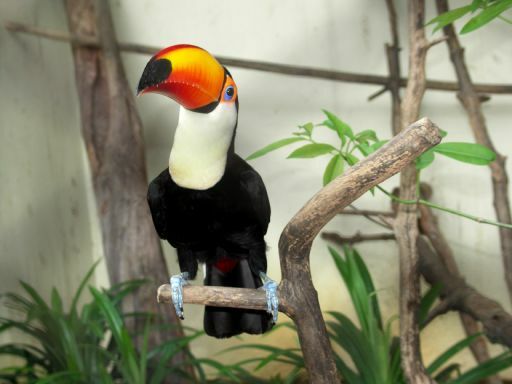 He is well experienced in handling overseas orders. 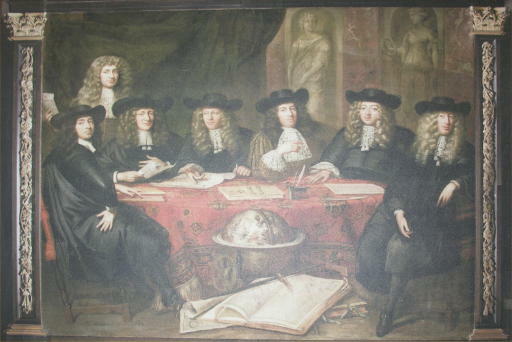 * Six of the gentlemen governors of the Hoorn chamber. 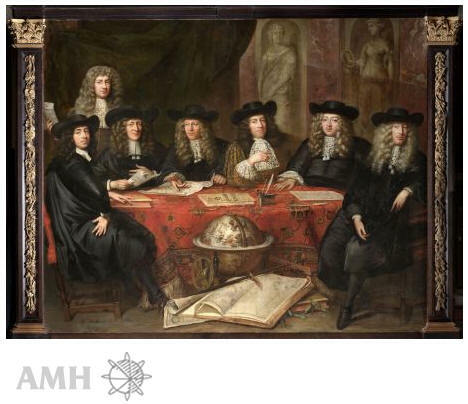 * Depicted back left a governor with letter in hand. 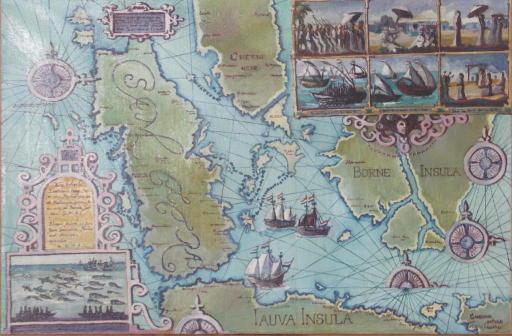 Attributes such as the atlas with sea charts, Jacob's staff, stellar globe and astrolabe are decorative features. 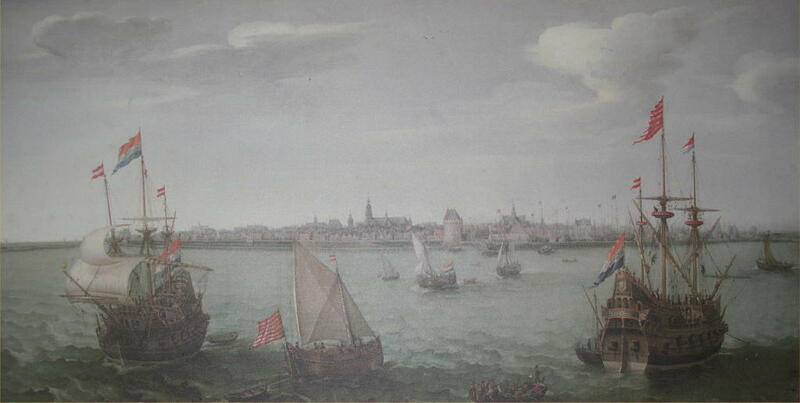 * The painting comes from the chamber premises of the VOC in Hoorn on the Muntstraat. 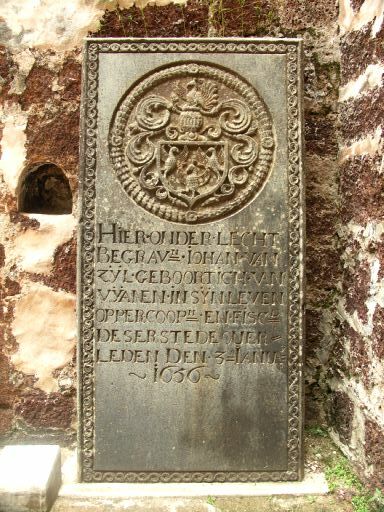 In front of the Stadthuys, "Christ Church"